We at Edgeley would like to say a huge well done to Paul Dorsett for completing his CITB site Safety plus course for site management safety. 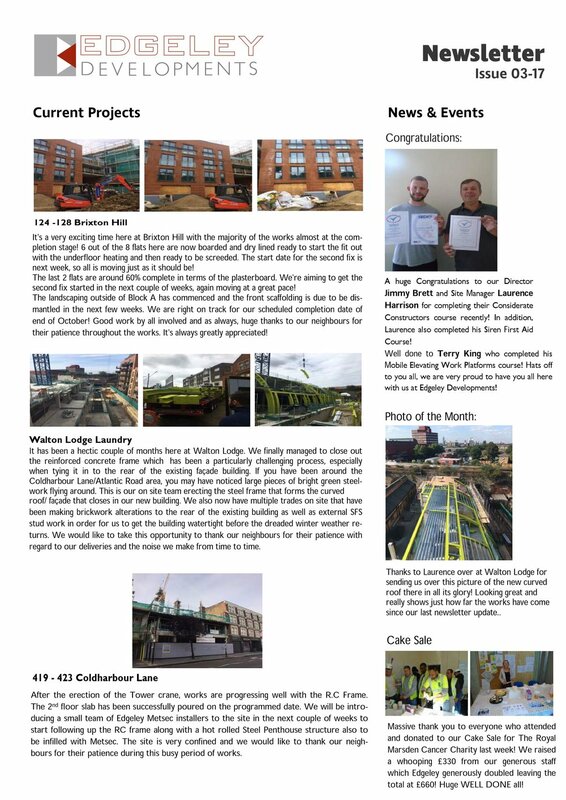 This is a fantastic achievement and we are proud to have Paul as part of the Edgeley Developments team. Work is steadily progressing with the groundworks at Walton lodge. With a complicated substructure and site constraints, we have managed to progress enormously with the installation of an extensive capping beam and removal of spoil from site. Some impressive plant is on site to assist us in carrying out the job in a safe and efficient manner; in the form of a 1.2 tonne concrete crusher to remove excess concrete above pile cut off levels. Works are coming to a close at the former West Norwood Fire Station. Our landscaping division have been working hard over the last month and are finishing up this week on time and within budget. A huge well done to all involved, keep up the good work.! Works are progressing well on our project on Brixton hill. After a few hard months in the ground, decontaminating the site which former use was a petrol station, combined with a high water table provided its challenges. The first floor slab has been poured to program and we are now steaming towards a complete frame in February 2017. A big thanks to all involved. A huge well done to everyone at our site on Brixton Hill involved with the erection of the crane. This is quite a feat due to the large logistical restrictions we have on the site. The crane will be used throughout the construction which includes an RC frame, Cold rolled steel penthouse structure and a mixture of brickwork and Zinc cladding. Employee of the Month - September! This months Employee of the Month award goes to Daniel Moore for his outstanding work at Edgeley. Daniel has been with us for a long time and has always been an exemplary employee, by putting in that extra effort and ensuring the work gets done, this is why he is being recognised for his outstanding contributions to the company. We are happy to announce the successful opening of our new road under Walton lodge laundry. The site is constrained on all four side sides so the only way in was to go under. The construction of the new road contributed to the projects feasibility and build ability. For more information on this project please see our project page. 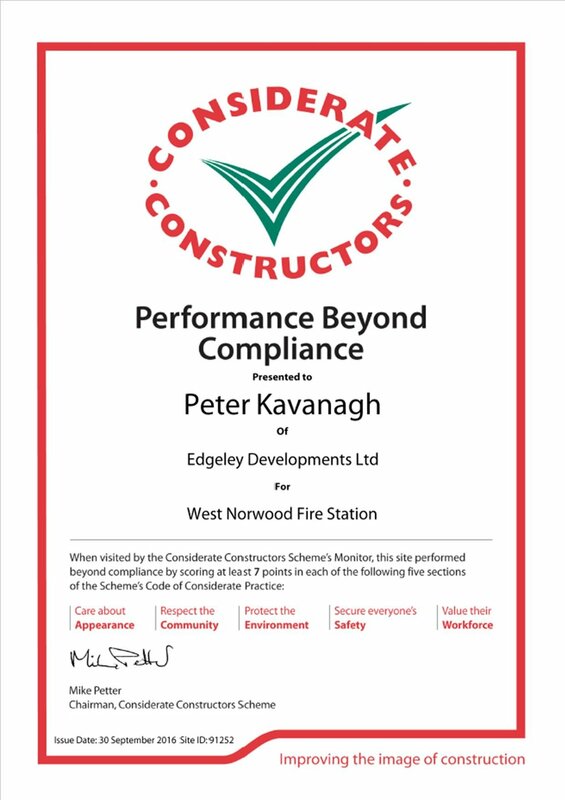 A Massive well done to everyone at the Former West Norwood Fire Station who achieved an amazing score of 7/10 on their visit by Considerate Constructors! This score of "Very Good" is an impressive achievement. The next step is to take all feedback into account and turn that "Very Good" into an "Exceptional" on our next project! We are pleased to share with you all the new look of our refurbished Office! As you can see they couldn't be happier! !